You love it or you hate it. This ol’ time breakfast staple can be the most delicious and healthy breakfast of your life, or can turn out like a big gooy mess of fiber. I’ve only cooked real oats once and I’m pretty sure there are still oats stuck to that pan. Regardless, I’m trying to get back into it and, in looking for new recipes for oatmeal, I discovered all the wonderful things this little grain can do! –Oatmeal does wonders for your skin. Use it to treat acne, itches, poison ivy, sunburn, and dry skin. –Oatmeal is also safe to use on animals…so if Fido gets ticks or has itchy skin, whip up an oatmeal bath. Search online for special “pet friendly” recipes. –Make a dry shampoo. Combine 1 cup oatmeal with 1 cup baking soda and blend it up in the blender. Rub it into your hair, give it a minute to soak up the oils, and shake off. You can use this on smelly dogs, too! 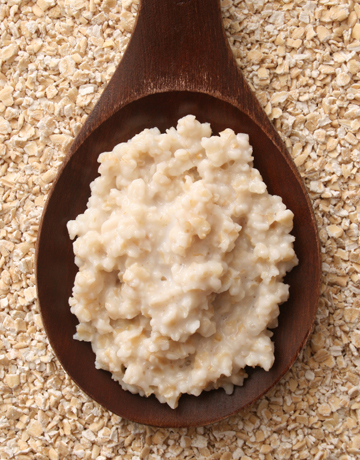 –Ironically enough, oatmeal can help with constipation. Try eating uncooked oats before opting for any medication.